9 Feedbacks on "Army Wants a More Potent Sidearm"
They will totally screw this up. They will never go back to Browning’s design. Never. Expect a 10 mm POS Glock. However, I own a Glock 21 (.45ACP) and I have no complaints. Have to disagree. 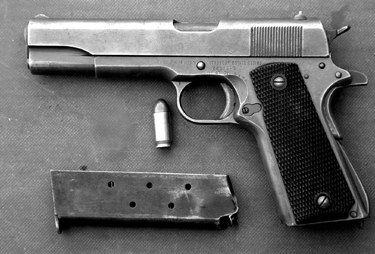 I carried the M1911A1 for many years on active duty, right up until they took it away and gave me the Beretta. I do not defend the Beretta, but it would be a bad mistake to revert to the 1911. The magazine capacity is far too small and its design is antiquated. Incomparably better to got with a higher-capacity .45 model that’s more ergonomic, of which there are several examples. I agree with Donald. I LOVE the 1911 and own many. But for a service sidearm there are many modern alternatives that are better suited. There is a reason Glock, Sig Sauer, and other foreign based manufactures have opened production facilities in the US now. They will probably go with a .40 cal. Not a bad choice. It would hold a couple more cartridges than a .45 due to the smaller diameter, and power is in the same ballpark as a .45. I recall the controversy over the original decision to replace the .45. There was no need at the time. A waste of money. Contractor politics. At least they didn’t make the same mistake when it was proposed to replace the Browning .50 BMG, which has served extremely well, and still does the job as well as any alternative. Finally, the gov’t is still buying BILLIONS of rounds of .40 cal hollow point ammo to use against Americans by Obama’s “civilian military”. WUWT? What bullet are they using FMJ or JHP? I favor something new. A better balance between stopping power and capacity with a strong emphasis on reliability. I understand the macho desire to just go big (.40, 10 mm, etc) but the search for a better sidearm should be more then that. there is one now with STI but the Army is needs 400k and STI doesn’t have the capacity so they will have to hook up with a major. They don’t want a 357 or 40. If they want higher ammunition capacity, they could go with the ParaOrdnance P-14. It’s really a double-stack 1911. Holds 14+1 rounds.